It was getting later in the evening as Chester walked out into the living room with his blanket. Chester wasn't tired yet and there wasn't school tomorrow so he made his way over to the couch and climbed on up seeing that there was some comedy clip show on TV. Chester smiled as he sat there watching it. Certainly different than what his father used to watch at night. Chester had not come from the best of homes. His mother was a good person and very kind and loving. His father. Chester didn't know. His father didn't take the death of Chester's mother well. Things deteriorated with time. Chester's incontinence didn't help things too much either. Chester had to learn how to do a lot of things himself. His father would rarely cook anything anymore so he had to make sandwiches and such for himself or go hungry. 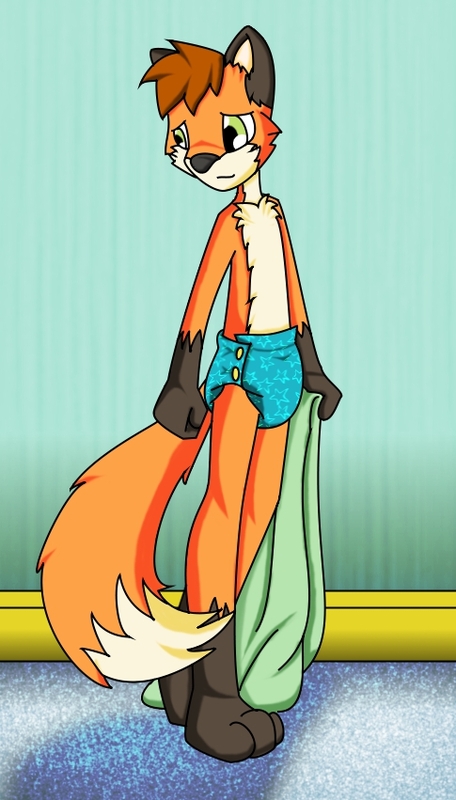 After a while his father simply couldn't be moved to change Chester so he had to learn to change his own diapers. Indeed even getting diapers proved a challenge. Chester had to learn to make them last as he had to practically beg his father to buy more. Stretching his diapers out gave him quite the diaper rash too as money was never spent on powder, or oil, or rash cream. Yes Chester's young life seemed quite dismal. If they had lived closer town maybe someone would have noticed and helped. But it didn't end until the night when the neighbors heard a loud bang from that old house down the road and police showed up. They found Chester crying in his dingy room. When they'd taken him out of the home there was a sheet over his father's chair and near the top of it he could see red. "Hey there Chester. Not sleepy bud?" Asked an older male fox who waked over and sat down on the couch. "Nah. Sides no school tomorrow." Chester smiled as he snuggled up to his uncle with the blanket. "Can I watch some TV with you for a while?" "Sure why not." His uncle nodded with a smile stroking the young fox's headfur. Since that night Chester had come to live with his uncle and his Aunt. It was many years after that night now. Chester was now eight and doing well in school. Here in Denshire Falls he had no shortage of friends. There was never a shortage of diapers either. Chester had developed a fondness for cloth diapers and and now wore them most frequently. Life indeed was looking up for Chester now in the care of his Uncle and Aunt. Gotta love the big bushy tails foxes have. Cute little character =) I like them quite a lot.